Bush urged those who packed into the university's arena to not let defeat or doubt define what can be achieved. It's a lesson Bush said he learned early in his political career, which he detailed in a humorous story about launching his first major bid for office. "I called mother and said I'm running for governor against Ann Richards, and she said you are not going to win," he told the crowd. It was no surprise, said Bush, when extremist recently launched an attack in France. That case and others is why he believes the lessons he learned after the 9-11 attacks are relevant today. "So one of the real dangers is an isolationist tendency," said Bush. He warned becoming less dependent on Middle Eastern oil should not be an excuse for withdrawing from that region, he argued there are political, humanitarian and national security reasons for staying. "And so when the pressure is off, they strike in order to frighten us who believe in freedom," he said. He explained ... how his father once fought Imperial Japan during WWII, but now that Island Nation has embraced democracy and is one of our strongest allies. 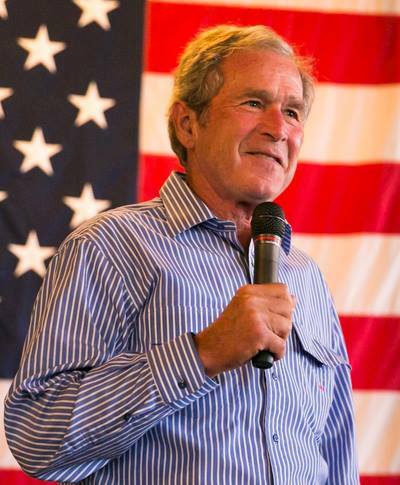 Words that will most likely be dismissed by those currently in the White House, Bush suggested political leaders should always seek advice and listen, even to those they do not agree with. Sound advice from a proven wartime leader.